Did someone say bookmarks?!?! 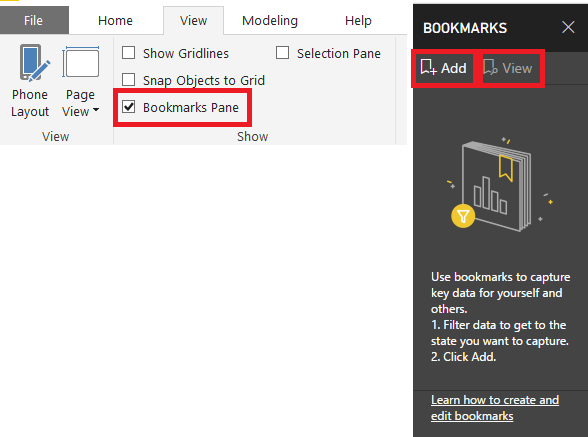 While the term “bookmark” is often related to a boring placeholder inside of your favorite novel – in this case bookmarks refer to a pretty cool superhero ability within Power BI. I often say that if you have the most awesome dashboards, reports, and information pockets filled with insightful goodness but your users can’t navigate easily and in a way that makes sense and tells them a story……well then your awesome dashboards and reports are only half as good. It’s like reading a book, but the pages are scrambled and the story makes no sense at all. 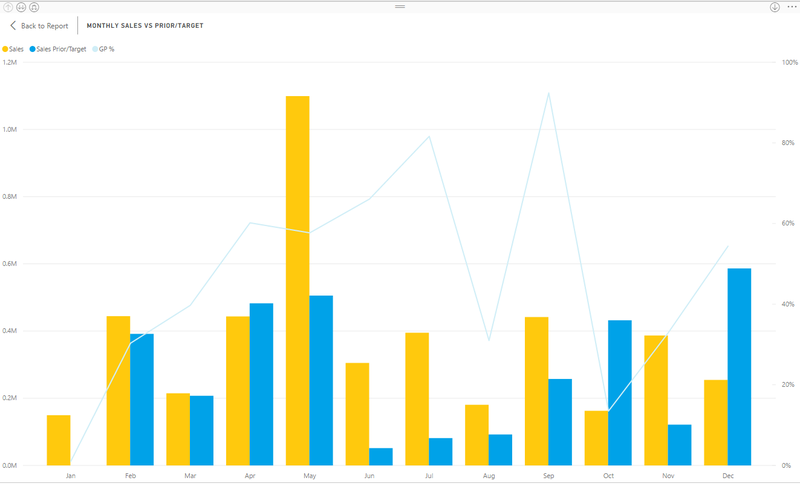 Of course I’m talking about the user experience, but even more so, the value that a user can gain from these Power BI reports – especially if you have many, many reports and dashboards, making navigation a cumbersome task for users. 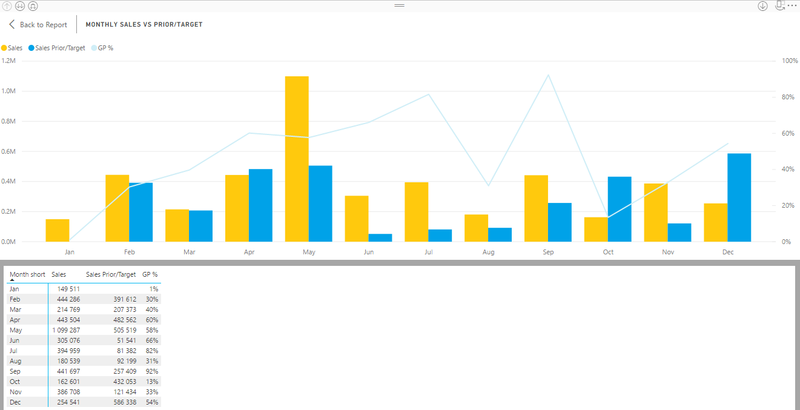 Note: In order to use or even see the bookmark option in your Power BI, please make sure that you have updated to the latest Power BI Desktop version available, either from Power BI or from the Windows 10 Store (by the way if you download from the Windows store, it will now automatically update your Power BI Desktop version every month, without having to re-download the entire file every time there is a new update). 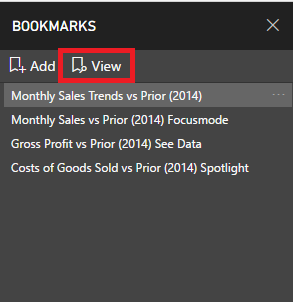 Once you are up to date with the latest version, open Power BI desktop and follow these steps to get the bookmarks feature to show up on your Power BI Desktop ribbon. Click ‘OK’ to activate the Bookmarks preview feature. From the ‘View’ ribbon under the ‘Show’ group, check the ‘Bookmarks Pane’ to see the bookmarks pane pop-up next to your ‘Visualizations’ and ‘Fields’ panes. There you will see two buttons, a button to ‘Add’ a bookmark, and a ‘View’ button which we will later use to “view” or browse through our bookmark story. To add a bookmark is simple…. Go to the report you want to bookmark, you apply the relevant filters or context and you save it as a bookmark by clicking on the ‘Add’ button as above. By default it will give it a name called ‘Bookmark 1’, change this to a meaningful name which also describes the filter context. I’ll call this one ‘Monthly Sales Trends vs Prior (2014)’. Cool!! We’ve just added our first bookmark!! Let’s add a few more. But before we do, let’ have a look at what we can do with our visuals / reports to make them focus on a particular aspect. 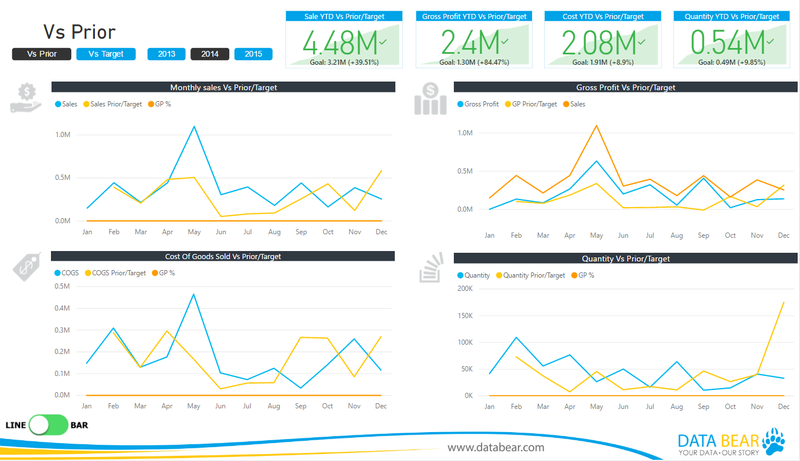 Click on any chart, graph or table, and select the ellipsis in the top right-hand corner. We the old ‘Pop-into-focus-mode’ option which we can use to see only the chart in question. We have a ‘See Data’ option, where we can see the chart only but this time with the supporting data as a table underneath. Finally, a new option called ‘Spotlight’ which drowns out all other charts and tables, and focuses only on the one you’ve selected. Of course it’s important to mention at this point, that any of these “views” can be added as a bookmark to your ‘Bookmarks Pane’. Lets add a few now…. Let’s view our bookmarks by clicking on the ‘View’ button. Once the ‘View’ button has been selected, you’ll notice a few things – from the Bookmarks pane we can see the first bookmark highlighted, as well as the corresponding bookmarks navigation tab at the bottom (A presentation mode of sorts). The bookmarks navigation pane shows us the currently viewed bookmark, i.e. Bookmark 1 of 4, the name of the bookmark, forward and backward arrows, as well as a close bookmarks button indicated by an X. Placing your bookmarks in a strategic order, makes for a pretty nifty way of presenting and telling a compelling data story. You can click and drag bookmarks from the bookmarks pane in the order best suited for your story. The selection pane is useful to show or hide any item on your report, including images, charts, graphs, slicers or literally anything you place on the reporting canvas. 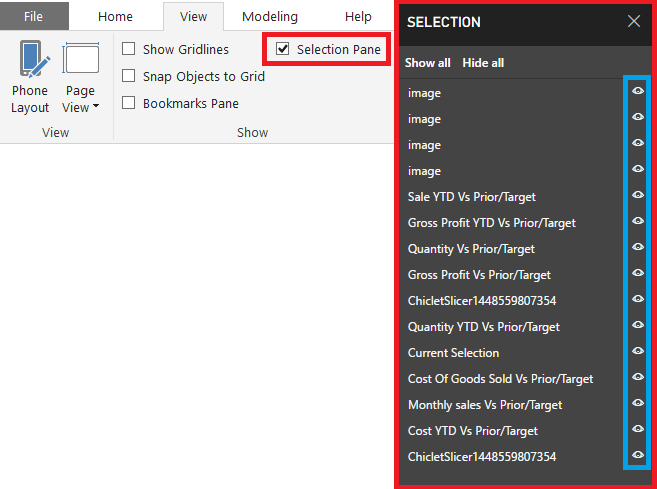 To see the selection pane, go to the ‘View’ ribbon under the ‘Show’ group, check the ‘Selection Pane’ to see the Selection pane pop-up next to your ‘Visualizations’ and ‘Fields’ panes. There you will see two buttons, a button to ‘Show all’ and a button to ‘Hide all’. These will as you’ve guessed show all or hide all items on your report. There are also little “eye” buttons next to each item listed on your selection pane. Clicking on these for each item will either hide them or show them. As before, hiding any item or items on your dashboard will also be applied when you save that view as a bookmark – awesome!!! 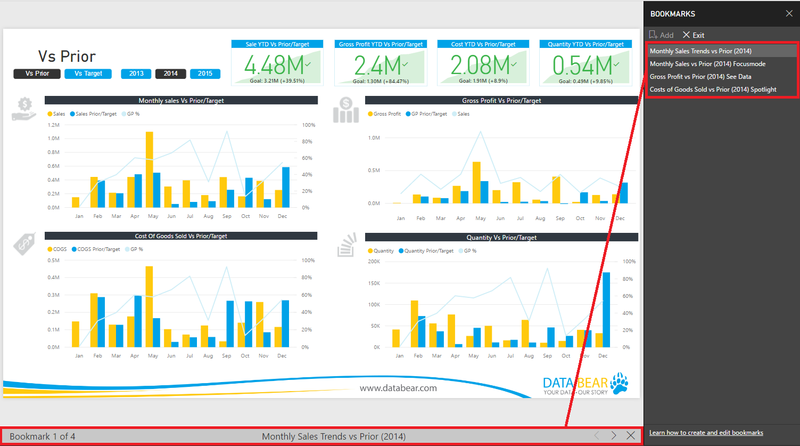 For this section, we are going to add an image button to our report that will switch our chart types from bar charts, to line charts – yes, very exciting I know!! We’ll do this of course also with the help of bookmarks and the selection pane. To get started I we’ll be using the image of a button (any image of any button – just use Google to find the right one for you). The one I chose looks like this – edited with paint or any other image editing software of your choice. Let’s add the words ‘Bar’ and ‘Line’ to show the switching options. To get the button switch to show on the line side, just flip the image horizontally with your imaging editing software. Great, so now we have two images, one that is switched to ‘LINE’ and one that is switched to ‘BAR’. Before you start doing this, make sure that your Selection and Bookmarks pane is open. Select the 4 bar charts, by using Ctrl + left mouse click – notice how the selection pane shows the items you’ve selected. 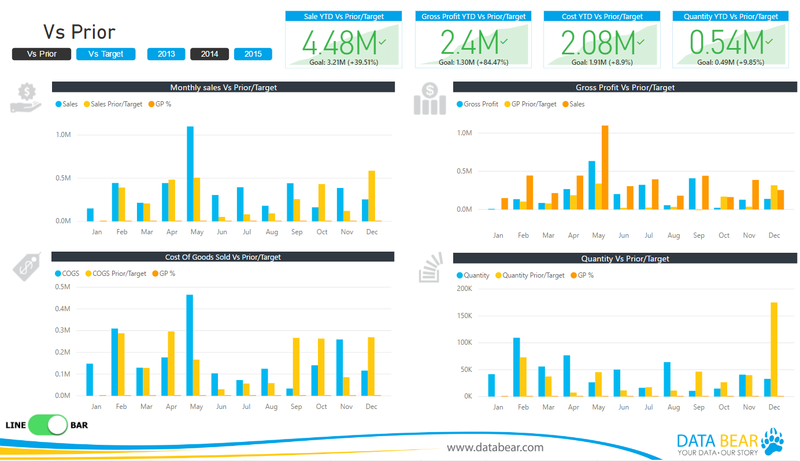 Now press Ctrl + C to copy the charts and Ctrl + V to paste duplicate copies of your bar charts on top of your existing bar charts. Also import both your bar and line buttons and overlay them on top of one another. 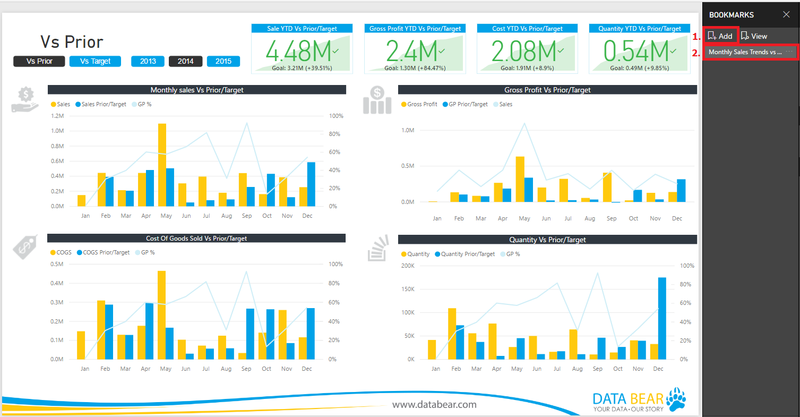 At this point change your duplicate bar charts to line charts and align them with the bar charts underneath. To assist with this process, make sure to use the selection pane item hide / show buttons. Notice now how the two overlain reports are nicely aligned. To start, select only the line charts and the button switched to line. Click on ‘Add’ from the bookmarks pane. Rename the bookmark to ‘Monthly Trends (Line)’. 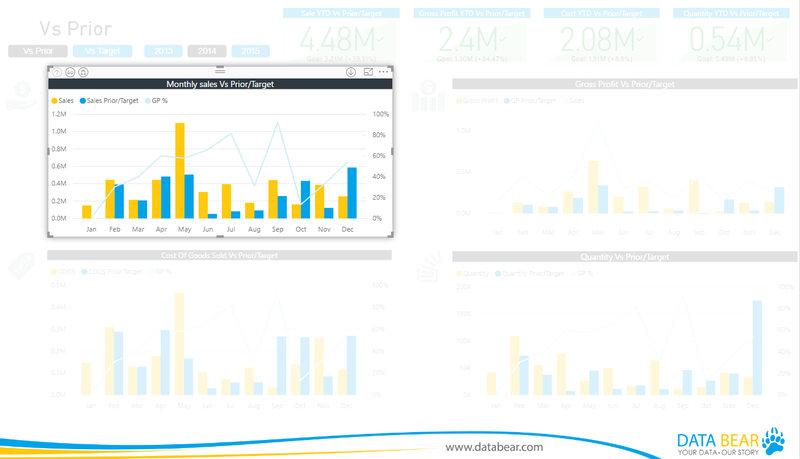 Repeat the process with the bar charts and button switched to bar, call the bookmark ‘Monthly Trends (Bar)’. Great!! With the bookmarks now created, let’s link the button to the respective bookmarks. Select the ‘Monthly Trends (Line) bookmark. Select the line / bar toggle. From the ‘Format Image’ menu, switch the Link slider to On. From the ‘Type’ drop-down, select ‘Bookmark’. From the ‘Bookmark’ drop-down, select the ‘Monthly Trends (Bar) bookmark. We select the bookmark here we want to go / switch to when the toggle button is selected. Repeat the process below for the ‘Monthly Trends (Bar) bookmark. Select the ‘Monthly Trends (Bar) bookmark. From the ‘Bookmark’ drop-down, select the ‘Monthly Trends (Line) bookmark. Again we select the bookmark here we want to go / switch to when the toggle button is selected. Note: Notice when you change from one bookmark to the other how the selection pane show / hide buttons change. Awesomeness with a capital A!!!! While working on the Power BI Desktop file, the buttons function by using Ctrl + left click. Once the file has been published to the cloud service a simple left click will do the trick. 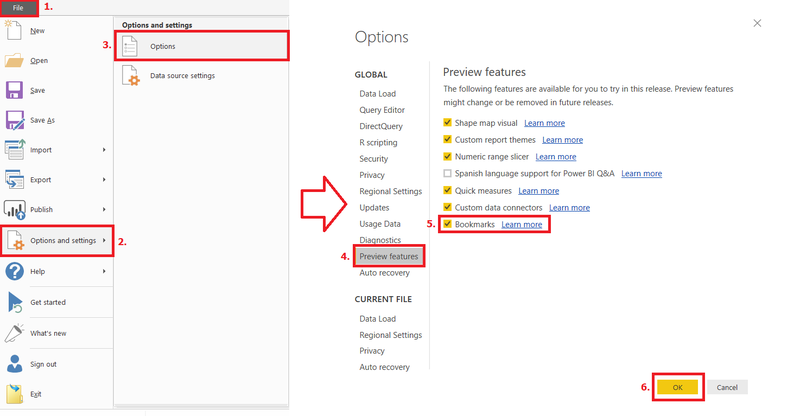 Also note that you will only be able to add or access the bookmarks menu in the cloud service, once you have published a Power BI Desktop file with at least one bookmark inside it. And there you have it!! A report which has some pretty neat button / toggling reporting properties. It really does open a world full of navigational and user experience awesomeness – just give it a try!! As always, please feel free to ask questions, share your bookmark and button ideas -and take your Power BI reports from average to exceptional!! Until next time, keep safe and stay blessed!! Llewellyn is a Data Bear Consultant with over 10 years experience in Business Consulting / Analysis and Business Intelligence Application Development. His service offering is one that builds on the client's needs, from revising business processes all the way through to the development of applications that will support the organisation's operations and decision making requirements. Very happy that you enjoyed it – please do let me know should you have any questions. Hi, thanks a lot for the great lesson!! I managed to complete it but I was wondering if there is any chance to exclude the filters from the bookmarks. I try to better explain: I created a report with active filters and I want to use the bookmark “Table on/off” no matter which filter selection I have in the report. Hey there Enrico. Very happy you enjoyed the lesson. What you are trying to accomplish is very possible yes. 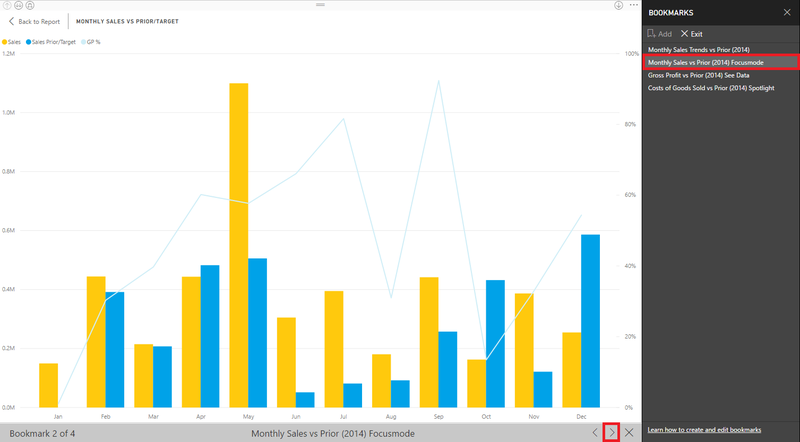 Once, there – you’ll see that Power BI has added some additional flexibility to deal with the way in which report filters, slicers and visuals respond when using Bookmarks. Focus here on number 1 – which allows you to include / exclude ‘data’ properties (these include filter, slicer and visual properties). It sounds to me like this is the one, you want to turn off. In order to do this, click on the ellipsis next to the bookmark and deselect the ‘Data’ property. Once done, when you’ve applied a filter and used the slicers or selectors, they won’t move back to default when you go to another bookmark and come back to that one. Give it a try and please do let me know if you have managed or if you have any more questions. Data Bear adopts a consultative process with its clients that includes a Predictable Project Scope, Phased Timeline and Fixed Price as some of its guiding principles. It also embraces a structured project management approach with solution quality assured with by 100% money back guarantee.